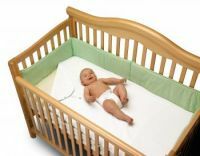 Summer Infant Ultimate Crib Sheet Discounts Apply ! The ultimate Crib Sheet is made of three layers - a sheet on top, soft padding in the middle and the final vinyl layer that rests on the mattress. Easy to install, the crib sheet attaches to the crib's bars, instead of under the crib making it perfect for middle-of-the night emergency bedding changes. Machine washable for easy cleaning.